Belle vue sur la piscine, spa, club-house, le golf, les montagnes, et practice. Étapes de restaurant, salon, terrain de golf, pro-shop, piscine, spa, centre de tennis, et club-house! Porte gardée station! We have spent a lot of time at the Resorter and stayed in many different units over the span of 15 years. This was one of the nicer units we’ve stayed in and the location is great because it is close to the driving range. Bob was easy to deal with and he added some nice little touches on our arrival. Would definitely recommend this spot and are very likely to stay here again in the future. Smart looking “pad” in the desert. When we arrived, Bob was there to greet us, give us the key and show us how to work everything. The place was clean and exactly as in the pictures. There was a bottle of wine and lots of snacks waiting for us, plus a whole array of toiletries. We really appreciated that! Although it was raining...we loved the patio area and spectacular views of the green belt. Would recommend it to anyone looking for a smart looking “pad” in the desert operated with great attention to detail! Great location....nice community. House was very well stocked and extremely clean. Would have liked it if all the lights and plugs worked, but that is a minor problem. Would definitely recommend this condo. House was short walk to heated pool, which was lovely and close to Club house. Place was clean. Cupboards in need of less clutter. Enjoyed the strawberries, juice and bagels upon arrival. Instructions need to be provided to operate TV. Batteries for garage door opener and TV were replaced by us. Bob was available for our many calls. The front door needs the door knob fixed so it can be locked. Comforters in need of being laundered. Neighbors were very friendly. Bikes provided, all tires flat. The air pump provided did not work, so we had to load bikes in car and go to gas station for air. Garage needs cleaned. Plenty of dishes, silverware, pots and pans. Outdoor trash had not been taken to curb was full and running over when we arrived. Directions did not tell you to put it out, just stated trash pick up on Monday. Kitchen and great room were well appointed with updated appliances. 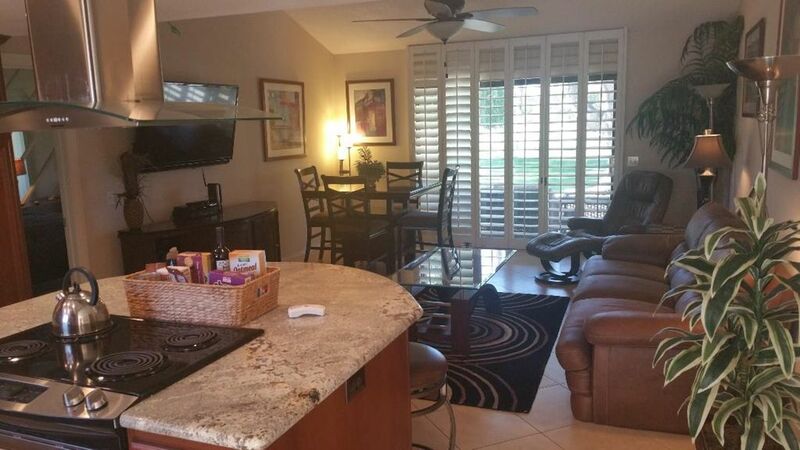 Very relaxing location and nice condo.